Clearly, these guys have no Christmas errands to run. No reindeer games to join. Maybe they’re just resting up for the big night? Boy was I tempted to step outside, creep up to them, and look for magic sparkles glistening in their coats. Last Thursday afternoon I was cleaning house, trying to get out the door to finish some shopping, when I stopped mid-whirl in the kitchen to notice these two fellas hanging out in our backyard. Deer trot through our yard often, but never before have I seen more than one buck with racks as big as these two, just hanging out! I texted my Dad and brother, seasoned hunters, who spent many an October weekend traipsing through the mountains only to come home empty-handed. My Dad said he’s rarely seen a buck as large as that one in the rear. They looked so mellow, so chill. So completely opposite of how I felt with my growing list of errands, presents to buy, events to attend, and things to do. It was good to just stop for a few minutes and watch them. Kara reminded me of this poem by Mary Oliver. It’s been a whirlwind month. It always is. Do you feel it too? The hustle. The impossibility of catapulting yourself off the holiday treadmill? I was touched when a friend’s husband sensitively asked, “What can we do to make December less stressful on women?” Sweet hubby. Seriously though. It’s stressful for everyone, and for the ones making sure Christmas happens, it’s a whole lotta work. It reminds me of that fake job interview that went viral on youtube. Did you see it? The one where they posted a job interview online and in newspapers for the role of Mom but don’t give away the job title. When the interviewer explained the job description, he said, “Oh! and Holidays – you don’t get holidays off – on Holidays the work goes up. And it must be accomplished with a happy disposition. We demand that.” Wide eyes follow with responses like, “That’s almost cruel!” “Is that even legal?” If you haven’t seen it, give yourself a present and take a few minutes to watch. You’ll love it! Sounds awful, I know. That was last Monday. I got over my scrooge-moment and I’m doing much better and we’ve been enjoying the Christmas season. I’m so proud of Eliza for organizing our neighborhood food drive this year. We pulled in thousands of dollars and a carload of canned goods. So grateful for her help and the generous people that live around us! We gathered donations at our annual Pine Tree Party. Santa came and lit the tree, then visited with all the kids. Here are a few of the faces we love sharing this tradition with! Just as we were closing up shop and getting ready to jet home (our toes were so frozen!) we turned around to see the December Super Moon coming up over Millcreek canyon. Once the pine tree is lit, Christmas is in full swing! The boys wrote their letters to Santa right after Thanksgiving. They’ve been a lot more naughty than nice this year. I am positive Santa has seriously considered coal a number of times. There’s been lots of stealing treats and not eating dinner, devouring chocolate underneath their beds. Packs of gum in my purse perpetually disappear (with wrappers conveniently disposed of behind their dresser), and hitting rather than hugging has been their MOA for a little too long. I honestly don’t know what to do some days! Then I go on a walk with Michelle and trust in her words. She tells me, You’ll be surprised. What you are teaching them does sink in. It may not look like it right now, but it will. Then the next day I am putting in laundry and listening to Oh Holy Night and this phrase keeps rising into my mind, humming out of my lips. So I scribble cursive on cardstock and tape it to the wall, big and loud. For all to hear. The boys have changed their tunes slightly. They’re trying. They’re disciplining themselves a bit more. Asking, serving, scratching out notes to their secret pals, and occasionally, hugging. Whether it’s the threat of no Christmas gifts or real Christmas spirit, I’m not sure, but I’ll take it! We pulled out our Polar Express book. The cover ripped and taped and ripped again. We made hot cocoa with candy canes and marshmallows and sipped from our Santa mugs. Gordon’s silliness is at an all time high lately. They sipped and laughed and listened as I turned down the lights and read them this favorite Christmas story. Last Monday night we decorated the tree. It is always pure chaos. 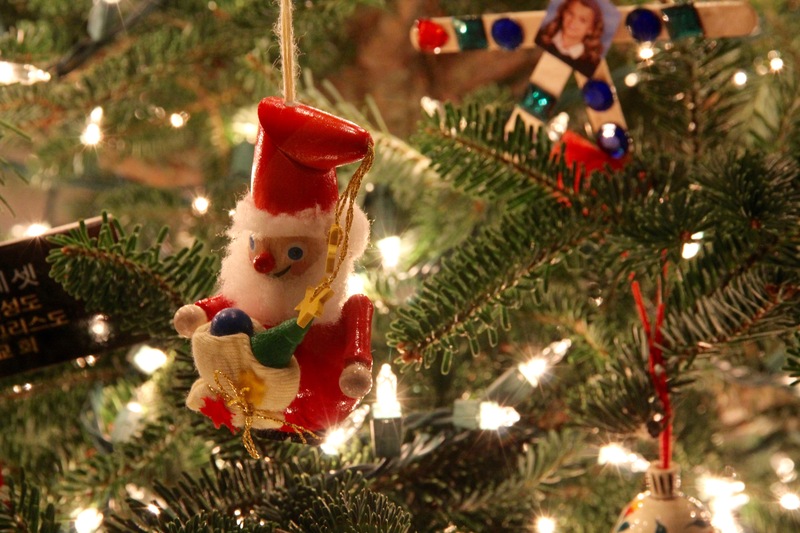 But no ornaments were broken this year – miracle! And with the kids getting older, it was kind of enjoyable! Spencer was so happy to pull out his golden snitch ornament. You know this, because I’ve shared it before, but all our ornaments represent a person, place, experience, or event. It’s a tree full of memories and meaning. Since November, I’ve been trying to find the perfect ornament to represent my Mom. At first I was on the hunt for a bird, but I just couldn’t find the right one. I looked for an oriole and found two, but decided to give them as gifts. I looked and looked but couldn’t find the right thing. Until last week. While shopping, I stumbled upon this angel. And I knew it was for my Mom. Corn-silk hair like my Mother’s. Light and gentle just like my Mom. And prayerful, just like my Mom. Then, as if it were more than coincidence, a row below this angel, I saw a single white snow bird. With long tail plumes, a tiny beak, and shimmering feathers. It seemed to be the only one of its kind. I cradled both in my hands and made my way to the check-out. I felt as if God had placed them there, just for me. Just for her. And I could see her smiling. This time of year it is so hard to be still. In fact, all year long it seems hard. Have you noticed it, felt the absence of it? We are making less and less time to be still. To ponder. There is so much to distract us. Our phones, our screens, our lists. I love that advice. For a few minutes, defy the Christmas hustle and make time to be still. Do not worry about what is coming. What will happen. What is inevitably moving your way. Just bask in the beauty of a child born to a beautiful mother and devoted father, a new star exploding light, beckoning in the sky, shepherds and believers quietly making their way into that humble cave of animals, and angels… angels literally filling the darkness with their singing and rejoicing that the King of Kings had finally come. What a beautiful post, Cath! You strew light everywhere with your kindness and gentle spirit. Joyous wishes to you Bella! I’m glad you found your corn silk angel and bird. Hi, I’m trying to reach my old friend, Pam Montgomery, and noticed she left a comment on your post (moving from VA) a few years back. I met Pam when I lived in Centreville for a summer with my sister and brother-in-law. Do you have any way of reaching her still? Pam has since changed her name back to her maiden name, I believe. Pamela Alejandra. She is on Facebook but I have not had contact with her in years. You might have luck messaging her there?